The quest for the insight-driven enterprise has spurned a mass exodus to the cloud. But cloud data ecosystems can be very complex with multiple data storage and processing options. 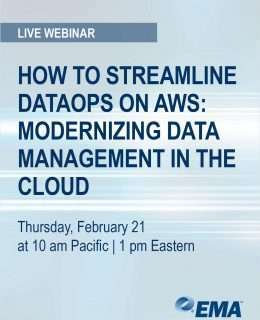 Join leading IT analyst firm EMA, AWS, and Trifacta for a live webinar that will help you: understand technology trends that simplify your analytics modernization journey; learn best practices to operationalize data management on AWS; establish operational excellence leveraging AWS data storage and processing; accelerate time-to-value for analytics projects with data preparation on AWS.